With the continuous advancements in nano-satellite technology, there has been a significant increase in proposed CubeSat missions for sophisticated space exploration. Due to their cost efficiency, their rapid development and the ongoing miniaturization of bus systems and scientific payloads, CubeSats offer the potential to increase the range of capabilities of deep space explorations. 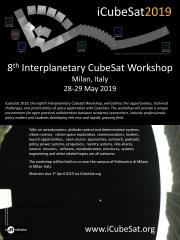 Missions already on launch manifests such as Mars Cube One, Lunar Flashlight, and NEA Scout will demonstrate the use of CubeSat technology for planetary explorations. CubeSat capabilities are also being expanded for other deep space missions and for the detection technique of Near Earth Objects (NEOs). As a result, it is anticipated that CubeSats will increasingly become an attractive option to conduct cost-effective interplanetary missions. This increase in interest and development, allows further advancement of Technology Readiness Level (TRL) of present technology, which can be extrapolated for extra-solar and near interstellar missions. The work presented in this paper addresses the potential utilization for interplanetary and near interstellar missions using technology developed from off-the-shelf components. The paper introduces the current CubeSat technologies, their baselines TRLs, and the requirements needed to conduct such missions. It further presents the feasibility study of the available CubeSat technology to conduct near interstellar mission by the year 2030. The feasibility of different propulsion, communication, electrical and power subsystems with a TRL level of 5 and higher in the next 10 years is evaluated. This paper outlines the fundamental mission and spacecraft architecture required to exit the solar system using miniature space system technologies. Further, it also identifies potential propulsion and launch opportunities, and present analyses regarding the communication link and preliminary cost figures. Thus, the analysis and suggestions presented in this paper help recognize the resourcefulness of CubeSat for interplanetary and edge of the solar system missions.